The Placer County Board of Supervisors are planning to vote and make a decision on the sale of four properties on Tuesday, Feb. 6. 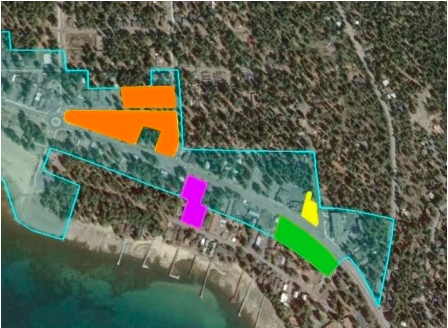 Four properties in the Lake Tahoe community of Kings Beach are being offered for sale or development. The properties are owned by Placer County or the Successor Agency to the former Redevelopment Agency, and are commonly referred to as the former Swiss Mart Property (highlighted in yellow on the image below), Eastern Gateway Property (green), Kings Beach Center (orange) and Town Center South (magenta). North Lake Tahoe is a largely mountain community, catering to winter skiing, summer water sports, and year-round outdoor enthusiasts. All four properties are within walking distance of the Kings Beach State Recreation Area, one of the most beautiful and well known beaches on Lake Tahoe. The Kings Beach commercial corridor has been a major focus of Placer County redevelopment programs, including improvements to infrastructure and the rebuilding and beautification of State Route 28 and pedestrian corridors. These four properties are in the Kings Beach Town Center along State Route 28 and provide excellent opportunities for transformative projects that will benefit future owner/developers and the community. All four properties are being offered separately, but it may be possible to incorporate two or more of the properties into a single related or compatible commercial or high-quality mixed-use project development. The Placer County Board of Supervisors are planning to vote and make a decision on the sale on Tuesday, Feb. 6. More information is available on the Placer County website.